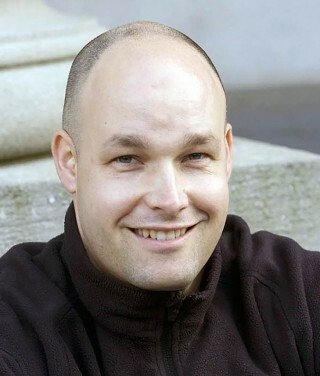 Elijah S. Ary was born in 1972 to Western Buddhist parents and spent his early years in Montreal, Canada. At age eight, he was recognized by His Holiness the Dalai Lama as the reincarnation of Geshe Jatse, a respected scholar and practitioner from Sera Je Monastery in Tibet. Elijah entered Sera Je Monastic University in South India at age 14 and studied there for six years, where he became fluent in Tibetan and an enthusiastic debater. He then left the monastery to receive a Western education, which culminated in a Ph.D. in the study of religion from Harvard University. He currently lives in Paris with his wife and teaches Buddhism and Tibetan religious history at several institutions. Elijah’s experience gives him a unique perspective into both Western and Tibetan Buddhist scholarship. His book Authorized Lives: Biography and the Early Formation of Geluk Identity, published by Wisdom Publications in May 2015, grew out of his Harvard dissertation. The book examines developments in early Gelug history through a close examination of the biographies of Je Tsongkhapa and Khedrup Je, and the works of the influential early Gelug writer and reformer Jetsün Chökyi Gyaltsen, who is known as Sera Jetsünpa. 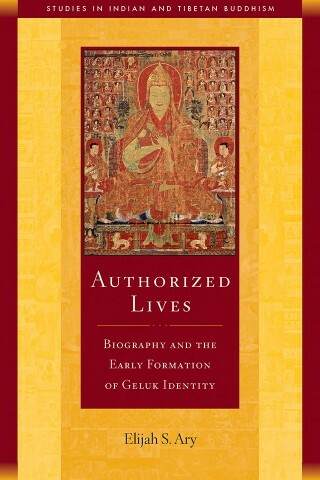 We are happy to share the “Introduction” of Authorized Lives, in which Elijah describes how Tibetan biography can be informative beyond just telling us something about the biography’s subject. As more recent studies of Tibetan biography have shown, these dismissive evaluations fail to take into consideration that, despite the adulatory language and fabulous stories, life-writing in Tibet nevertheless contains a plethora of historical information information evident not only once the panegyrics are set aside but right amid the flowery language itself. Even the wondrous dreams and visions common to this genre are informative of not only who the author’s audience might have been but also of the author’s intentions in composing the work. Such elements can even shed light on the historical and political climate at the time of composition. Literally translated, the Tibetan term for biography, rnam thar, means “completely liberated.” It implies that the lifestory being told is an account of the hero’s journey to full liberation from the fetters of cyclic existence, which is, at least ideally speaking, the purpose of a Buddhist life.3 This distinct genre of Tibetan literature is generally broken down into two main emic categories: outer (phyi) and inner (nang).4 Outer biography most often gives an account of the more directly observable physical aspects of the hero’s life, such as his5 birth, family background, education, travels, teaching career, and death. Although the hero’s personal dreams can be discussed briefly on occasion, this type of content is most often reserved for the inner biography. In accordance with its label, the inner biography is mostly an account of the hero’s inner, or spiritual, life. Typically it discusses the less visible and more personal interior aspects of his life, such as the meditative cycles the hero practiced, empowerments he received, and teachings imparted to him. It is not unusual for an inner biography to leave out details concerning the hero’s birth and upbringing, or even his travels, in order to focus primarily on his spiritual education. One subtype of inner biography is the secret biography (gsang rnam). The title “secret” does not imply that such biographies are kept locked up and out of view to all; indeed, what good would a biography be if it could not be read by anyone? Rather, a secret biography is dubbed “secret” because its purpose is to recount the most intimate details of the hero’s spiritual life: the aspects he would have kept secret (dreams, premonitions, meditative and visionary experiences, spiritual attainments, and so on) from all save his closest teachers and associates. And yet, by virtue of existing in written (and often published) form, biography always stands as a potentially public rendering of private events. The question then occurs: why did Tibetan authors write so overtly about features of a life that were ostensibly meant to be kept secret? Jan Willis has posited that every Tibetan biography contains elements from all of the three classic subgenres of biography: outer, inner, and secret.6 Each one of these “levels” of life-writing serves a specific function: the outer level acts as a historical record, providing the reader with dates and historical vitae; the inner level serves as an inspirational model whereby readers are moved to feel greater devotion for the biography’s hero and a desire to emulate his model life; and the secret level serves as a practical or “instructional” guide for advanced practitioners desirous of achieving the same meditative effects and states as the hero.7 Willis’s scheme does not necessarily hold true for all Tibetan biographies. The examples in this book demonstrate the imperfect fit of such general assertions about intentions or content. But it remains valid to note that many Tibetan authors seem to have felt the need to compose separate biographies to address different dimensions of the lives of their heroes. For example, Khedrup composed not only a full-length “outer” biography of his teacher, Tsongkhapa, but felt the need to produce a “secret” biography as well. Significantly, the latter work differs from the outer biography in structure, content, and focus. Tsongkhapa’s secret biography is the starting point of my study of biography and philosophical lineage in the first chapter. According to Willis, secret biography served in part as an instructional model for advanced tantric practitioners.8 But secret biography was also read by noninitiates and possibly even by lay patrons,9 such as those who helped sponsor the creation of the work.10 They may or may not have followed or even fathomed the texts’ instructions. But what is important here is the possibility that secret biography, like Tibetan biography in general, may have served purposes beyond the historical, inspirational, and instructional models that Willis describes. Willis neglects the crucial political functions that biography and secret biography can also have in the Tibetan context. Janet Gyatso has argued that one agenda of life-story writing in Tibet was “to assert the religious achievements of a master and his or her lineage in contrast to those of rival schools.”11 I would add that it has also served that function in rivalries within the same tradition. Biography can also be a tool for drumming up economic support and ensuring the continued aid of benefactors by providing them with the “proof,” often in the form of accounts of near-incredible spiritual feats, that the hero is worthy of their support and veneration. Critically, this worthiness of support also extends by association to the hero’s followers. In this way, a whole lineage can be positioned as worthy of the vital support of wealthy patrons, thereby making it possible for the lineage to survive. Indeed, through his work a biographer, who most frequently self-identifies as belonging to the hero’s lineage, is also making a statement about himself, not to mention his own worthiness of veneration and economic support. Few scholars have attempted to explore in depth the specific political or social dimensions or motivations of philosophical disputes. The majority of contemporary Tibetological scholarship on Buddhist philosophy has focused primarily, if not exclusively, on elucidating the intricate details of philosophical tenets and debates themselves.12 Karma Phuntso’s work on the philosophical positions of Mipham Namgyal Gyatso (1846–1912), for example, gives us a very useful and articulate account of the development of Madhyamaka scholarship in Tibet and of the rivalries it engendered. It also discusses the political climate prior to and during his subject’s life.13 Nevertheless, Phuntso’s historical focus remains primarily on providing his readers with a backdrop to the philosophical positions and debates that developed throughout the different Buddhist traditions in Tibet and not at all on the influence politics may have had on the philosophical positions taken or argued. One scholar to have recently broken from this tradition is Donald Lopez, who in his recent work on Gendun Chophel (1903–51) offers a translation and analysis of the latter’s Madhyamaka commentary. Lopez links the criticisms voiced by his subject to other key aspects of the figure’s life, such as his strong political opinions and his views on religion, which had been largely influenced by his travels.14 What Lopez does, then, is show that Gendun Chophel’s philosophical opinions, which greatly displeased many contemporary Gelukpa scholars, are in fact informed by his other political and intellectual preoccupations. Matthew Kapstein is also somewhat of an exception to the tendency mentioned above. In his discussion of Sumpa Khenpo Yeshe Paljor’s (1704–88) work on canonicity, given under its short title The Purificatory Gem,15 Kapstein remarks that doctrinal concerns (in this case canonicity) were influenced and restricted by political and sectarian convictions.16 He also points out that lineage history and “particular currents in Buddhist philosophical thought” were connected, one being the subject matter for the other.17 Kapstein therefore begins to get at the fact that doctrinal and philosophical issues not only influenced but were also influenced by nondoctrinal matters such as lineage construction, religious politics, and personal motives. 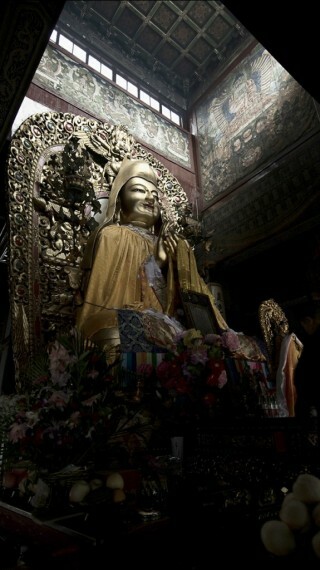 A large statue of Je Tsongkhapa at the Qing-period Yonghegong Temple in Beijing, China, 2014. Photo by Matt Lindén. Aside from these works, the influence of extraphilosophical elements and issues on philosophical positioning and argument has yet to be seriously investigated. This work therefore breaks from the tradition of most modern Tibetological research by looking at the formative period of the Geluk school and attending to the often contentious processes through which the now-accepted philosophical and lineage orthodoxies emerged. In this it attempts to position philosophical matters within personal and institutional exigencies. More specifically, this work considers how biography is used as a tool in constructing authority and creating intellectual and textual community. Rather than focusing primarily on the content of the dispute between Lodro Rinchen Senge and Jetsunpa, we will look instead at the roles that lineage creation, loyalty, institutional structure, and consensus building played in philosophical dispute. An examination of the socioeconomic and political implications of Jetsunpa’s Secret Biography of the Omniscient Khedrup not only allows us to discern how Jetsunpa’s text actually serves to adjust the author’s own position and status, it also helps us to see how attention to biographical rhetoric can serve to fill out, in critical ways, our understanding of Tibetan Buddhist intellectual history. In this way the present work moves forward the study of Tibetan religions by not only discussing important developments of early Geluk history but also by showing the importance of considering philosophical texts, positions, and disputes in terms of their human communities rather than as separate from them. Gelukpas maintain that a proper understanding of emptiness – an understanding that is “the summum bonum to be realized or attained as a soteriological goal”19 – is achieved through meditative experience, but that meditation is of little or no use without prior discursive knowledge of the tenets propounded by the Prāsaṅgika-Madhyamaka system. As was the case with monks at each of the three major Geluk institutions surrounding Lhasa, contemporary Gelukpas are expected to engage in a rigorous curriculum of philosophical study.20 The standard course of study in a Geluk monastery is comprised of about twelve different levels or classes, each lasting one or more years. The entire course of study can last upward of twenty years. As monks progress through each stage, they study and debate in great detail key elements found in specific texts. Three layers of texts are studied in the Geluk education centers. These layers might be represented as concentric rings, each one slightly smaller than the next. The first layer, the outermost ring, is constituted by the classic works of Indian Buddhist philosophers – most frequently Nāgārjuna, Asaṅga, Candrakīrti, Dharmakīrti, Bhāvaviveka, Buddhapālita, Vasubhandu, Śantarākṣita, and Kamalaśīla. These texts, referred to as rgya gzhung (“Indian treatises”), are often in compact verse translated into Tibetan and are usually accepted as authoritative by all Tibetan Buddhist scholars regardless of their sectarian affiliations. The texts serve as a common scriptural basis for philosophical discussion between scholars of the different Tibetan Buddhist traditions and thereby carry authority for the largest community of readers. The second layer, the middle ring, is made up of commentaries considered authoritative only by members of the Geluk tradition. It includes Tsongkhapa’s treatises on both exoteric and esoteric matters and the commentarial interpretations thereof by his disciples Gyaltsap Darma Rinchen and Khedrup Gelek Palsang. The collected writings of these three figures, referred to collectively as the Je Yabse Sum (rje yab sras gsum),21 or “lordly father and his two sons,” serve as both the defining limits of what is and is not an acceptable view for the Geluk school and as the doctrinal framework through which the tradition defines itself. As mentioned in the preface, to disagree with them, deny their validity, or criticize them is one of the gravest offenses a Gelukpa can commit. Indeed, to deny the absolute authority of the writings of the Je Yabse Sum is to renege one’s identity as a Gelukpa.22 A Gelukpa is therefore defined today not merely by his or her adherence to the views and teachings of Tsongkhapa but also by his or her adherence to Tsongkhapa’s views as interpreted and presented by Gyaltsap and Khedrup. Similarly, in her work on textual practices in eighteenth-century Lankan monastic culture, Anne Blackburn has defined a textual community as “a group of individuals who think of themselves to at least some degree as a collective, who understand the world and their appropriate place within it in terms significantly influenced by their encounter with a shared set of written texts or oral teachings based on written texts, and who grant special status to literate interpreters of authoritative written texts.”28 Put simply, then, a textual community is a group of individuals whose sense of identity as a community derives largely from the shared acceptance and performance – reading, chanting, and debating, for example – of a specific text or series of texts, either oral or written, composed by a specific interpreter or set of interpreters deemed by the community to be authoritative. The performative aspect is important for heightening the group’s sense of self-definition and cohesion. In the Tibetan monastic context, most activities – from morning prayers to evening debates – take place in groups and focus on a shared set of texts deemed authoritative by the monastic community itself. Even the teaching sessions, during which one studies the authoritative textbooks with a designated teacher, are most often conducted in groups. The notion of textual community allows us to better comprehend just how yig cha dynamics can be at the very center of a college’s identity and thus how criticism or repudiation of yig cha could lead to strong reactions, especially when the criticism comes from within the community itself. This is why the case of Jetsunpa caught my attention. As mentioned in the preface, Jetsunpa allegedly felt that the works of his precursor, Lodro Rinchen Senge, contained slight misrepresentations of the views propounded by Tsongkhapa and his chief disciples and therefore warranted replacement. But how could Jetsunpa criticize or even refute his own college’s yig cha, let alone replace them with his own, without provoking the community’s wrath? One possibility is that criticism of one’s own college’s yig cha was not as grave an offense in the early stages of the Geluk school’s development as it later became. Many figures were composing commentarial works on Tsongkhapa’s thought, and contrary to the situation nowadays, it may be that there was no standard Geluk textual authority. Another possibility, one pursued herein, is that Jetsunpa portrayed himself as a member of a seminal lineage in the transmission of Tsongkhapa’s views. Part of this effort, I argue, was achieved by his composing a biography of one of the lineage’s key figures. I began my research with an in-depth reading and translation of a key and telling panegyrical account of Khedrup’s spiritual life, his Secret Biography by Jetsun Chokyi Gyaltsen, in order to better comprehend its place within the larger tradition of Khedrup biographies. I looked at how Khedrup is portrayed in other biographical and historical sources, both earlier and later than Jetsunpa’s. As I came to discover, Jetsunpa’s own fortunes are also rooted in key shifts that occur in the biographical tradition of the seminal figure for the powerful Geluk school, the master Tsongkhapa himself. There is, therefore, a certain logic for this work to start with a study of Tsongkhapa’s biography. As we go through key moments in the development of Tsongkhapa’s and Khedrup’s life stories (chapters 1 and 2, respectively), we will glimpse important issues relating to institution, lineage, orthodoxy, community, and authority in Tibetan Buddhism. The final chapter concentrates on Jetsunpa himself, showing how all of these issues come together in his apparent suppression of Lodro Rinchen Senge’s commentarial writings on the thought of Tsongkhapa. We will look at Jetsunpa’s own life and historical context, at his preoccupations with doctrinal cohesion, and at his ostensible critiques of Lodro Rinchen Senge’s views. We will see that biography can be used to do more than simply inspire, inform, and instruct. Crucially, biography can also be used to make important legitimation claims that bear directly upon the formulation of both sectarian and personal identity and the creation of community in the great philosophical colleges of the monasteries of Tibetan Buddhism. Excerpted from Authorized Lives: Biography and the Early Formation of Geluk Identity by Elijah S. Ary, published by Wisdom Publications (www.widsompubs.com). Used with permission. You can read an interview with Elijah Ary in Mandala July-December 2015′s print edition. 4. For Tibetan classificatory schemes, see Gyatso 1998, 102–6. 5. I use the male pronoun due to the fact that the large majority of Tibetan biographical literature is about men. Nevertheless there are a few examples of autobiographies by women, an excellent discussion of which is Schaeffer 2005. See also Schaeffer 2004. 6. See Willis 1995, 5–6; and Willis 1985, 312. 8. A similar claim is recorded by Janet Gyatso, whose Tibetan informants assert that while anyone can read secret biography, only the initiate can decipher its true meaning (Gyatso 1998, 7). 10. In Central Tibet, due to the arid climate, the creation and printing of literary works such as biography were highly meritorious acts, but they were painstaking tasks that required the support of patrons sympathetic to the biography’s subject or author. Such patrons had to be wealthy enough to ship large amounts of wood with which to make printing blocks from the outer regions of Tibet to the center (see Ehrhard 2000). For a discussion of editorial practices and processes concerning a master’s collected writings, see Schaeffer 1999. 11. J Gyatso 1998, 102. 12. If we consider the works of scholars such as Wayman (1997; 1999), Hopkins (1999a; 1999b; 1987a), Thurman (1978; 1982; 1984), Cabezon (1988; 1992; 2001), Garfield (2002; and in Nāgārjuna 1995 and Tsongkhapa 2006), Thupten Jinpa (2002), Dreyfus (1997; 2003), and Karma Phuntso (2005), who have led the way in scholarly inquiry into this key dimension of Tibetan Buddhist culture, all – even the masterful doxographic historian David Seyfort Ruegg – have overlooked what other historical issues, such as lineage, institutional affiliation, and political loyalties, might be ingredients in the actual content of philosophical dispute as such. 15. Gsung rab rnam dag chu’i dri ma sel byed nor bu ke ta ka. See Kapstein 2000b, 121–37. 20. Not all monks engage in such academic activities. Historically, only about 30 percent of the monastic population (depending on the monastery) are estimated to have participated in scholastic training at the advanced levels. The rest were engaged in various nonacademic activities such as commerce, trade, and management of arable lands for the monastery. There were even groups of “fighting monks,” or dobdob (ldob ldob), that allegedly comprised up to 15 percent of monastic inhabitants (Goldstein 1989, 24–25). 21. Implicitly expressed with this term is the notion that Tsongkhapa had only two chief disciples. Had there been three disciples, then the term sum (gsum, three) would be replaced by the term shi (bzhi, four), indicating that together with the “father” (i.e., Tsongkhapa), the total number of people being referred to is four. Interestingly, in Paṇchen Sonam Drakpa’s history of the Geluk school there is one case where the expression jé yapsé shi (rje yab sras bzhi) is indeed used to refer to Tsongkhapa, Gyaltsap, Khedrup, and Dulzin Drakpa Gyaltsen (1374–1434/36). See Paṇchen Sonam Drakpa, Mind’s Ornament, 164. 22. Such a refusal is an outright betrayal of Tsongkhapa’s teachings as a whole (see Dreyfus 2003, 319–20). 23. Occasionally, however, an author may have had an impact on another college either directly or through a disciple. This was the case at Ganden’s Jangtse college, for example, where Jetsunpa’s works are accepted as authoritative scripture due to the influence of his disciples, Gomde Namkha Gyaltsen and Khyungtruk Jampa Tashi, the latter of whom was also Jetsunpa’s younger brother. 24. The manuals of Drepung’s Loseling and Ganden’s Shartse colleges were composed by Paṇchen Sonam Drakpa, while Gomang college relies on the works of the first Jamyang Shepa, Ngawang Tsondru (1648–1722). Ganden Jangtse’s yig cha consists of works by Jetsun Chokyi Gyaltsen, Gomde Namkha Gyaltsen (1532–92), and Khyungtruk Jampa Tashi (fifteenth–sixteenth cent.s). Sera Me’s were composed by Khedrup Gendun Tenpa Dargye (1493–1568). 26. Personal oral communication with Geshe Karma Sonam, circa. 1989.